When winds blew in and fires began burning earlier this month, many Southern California residents were left wondering, hoping, they had adequate limits of homeowners insurance. By this time for many, unfortunately, it was too late. 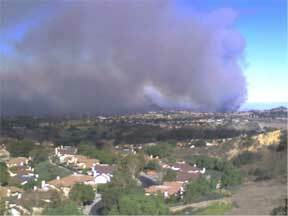 With 3 fires burning simultaneously out of control, all in different parts of Santa Barbara County and Orange County areas, it was a matter of time before these fires would spread over 40,000 acres and destroy more than 850 homes. Some homeowners were able to begin rebuilding immediately. Others were not so lucky and learned a very valuable lesson about the importance of having adequate levels of home insurance. Many homeowners are under-insured; it's a fact of life. When they originally bought their homeowner's policy the limits may have been accurate. But over time, costs have severely increased for building materials, labor and construction all eroding these limits so badly that if they are not increased each year, chance are they are slipping deeper and deeper into the under-insured quicksand that later prevents people from rebuilding their homes in their greatest time of need. Renovations, home built-in upgrades, and room additions to the home also increase home values over time and thus the amount of coverage needed. The typical homeowner policy covers more than just the structure; it also covers home contents. The longer we live in a house, if you're like most people in a consumer driven society collecting more possessions each year, the need for greater contents coverage increases continually too. So how do you protect these contents? Begin today by taking pictures and or video of your entire home. But don't stop there. Be sure to store this evidence in a location other than your home. Today more than ever many people are storing video and photos on virtual servers such as Shutterfly, Snapfish, or Apple's MobileMe. This is very effective and cost efficient because it typically costs little to nothing, can be easily updated often, never needs you to physically take the pictures or video anywhere, and can be accessed by claims adjusters instantly at your greatest time of need. Many people scan and store all sales receipts they bring into the house. Whatever method you use, just do it, do it often, and store it somewhere other than in your house. If you have any doubts about what your home insurance policy covers or what your home and contents would cost to replace, get with your local insurance agent and ask for a complete review. Often it's better to have your agent tour your house rather than trying to describe it over the phone. This way, if disaster does strike one day, you can rest assured you're in a much better position than if you do nothing today and hope tomorrow, like everyone does when the time comes, that you are adequately protected for homeowners insurance.